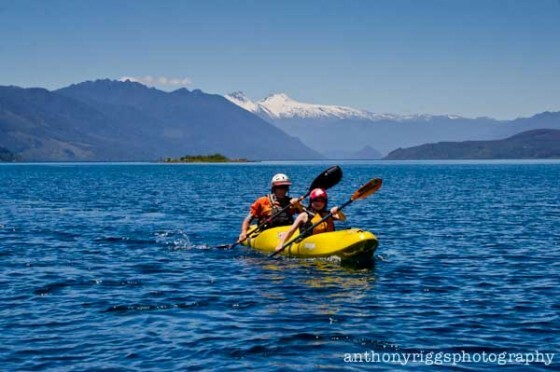 The Rio San Pedro (SP) is one of Chile’s premier play kayak/rafting runs through and which descends through a spectacular, yet threatened, river corridor. Draining a series of five major lakes the SP has guaranteed year round flows and relatively warm water. The fifth and final lake in the chain is called Riñihue and it is at this lakes mouth that the SP is born. Its transparent blue waters sport not only fun whitewater but some of country’s finest trout and salmon fishing. There are 2 takeout options. The first is at a bridge over the SP. To reach this point return to paved road and turn left following road towards Los Lagos for 22 KM. Takeout on river left as there are stairs and a handrail cut into the steep dirt face. Continue downstream for another 8-10 KM and there is another takeout option at balsadero (where a boat ferries your car across the river). There are small signs for the balsadero San Pedro so be on the lookout. At higher flows usually towards end of November and first half of December a world-class 15 meter wide play wave/hole forms about 4 km below the bridge. We have had up to 7 kayaks on this at same time. In winter, spring and early summer the river is high volume in a wide range of 7,500 to 50,000 CFS. By middle to late summer the flow drops probably as low as 2,000 CFS. 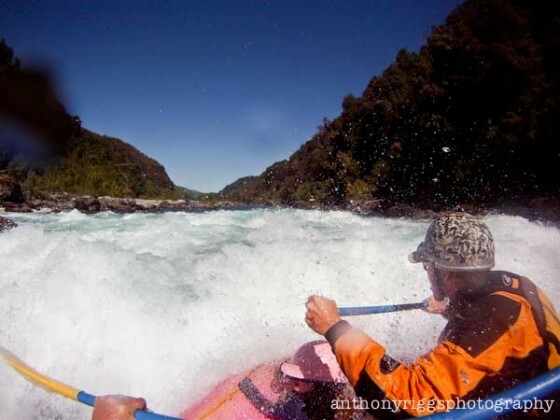 Rapids are all straightforward with one particular section sporting some Futaleufu style exploding waves. The river can be run in 4-5 hours but overnighting and camping/fishing on a sand beach is an attractive option. At the time of this writing the future of the SP is very grim. The company named Colbun has secured necessary permits needed to damm the river in one of the many controversial megaprojects threatening Chile’s free flowing rivers. Dynamite excavation has begun in earnest. It may your last year to run this world class river so make all efforts to get there before it is gone…I feel like I am writing what I wrote about the Bio Bio in mid 90’s. Other nearby rivers include the Curringue, Fuy, Florin, and Llancahue. I have personally paddled the Rio San Pedro, putting in on the lake and paddling to the bridge, it is my favorite river in the world. I went with a traveling school called the Alzar School that has great paddling for high schoolers. Best thing I ever did. Let you a youtube link of the 2017 “San Pedro Libre”. This is a meeting on white water which try to show that we want keep this amazing river free of dam. It`s a big white water party and everyone can join us this year in april 2018. P.S. This is “El Reloj”, San Pedro` sign.